PERSATUAN RUGBY UNION INDONESIA or Indonesian Rugby was formed in May 2004 by seven friends (Andrew Nugroho, Stephen Barber, Paul Quaglia, Lawrence Jorgensen, Andrew Vater, Brian Millen, Deano Herewini) who foresaw the purpose of developing the sport and culture of Rugby Union in Indonesia. 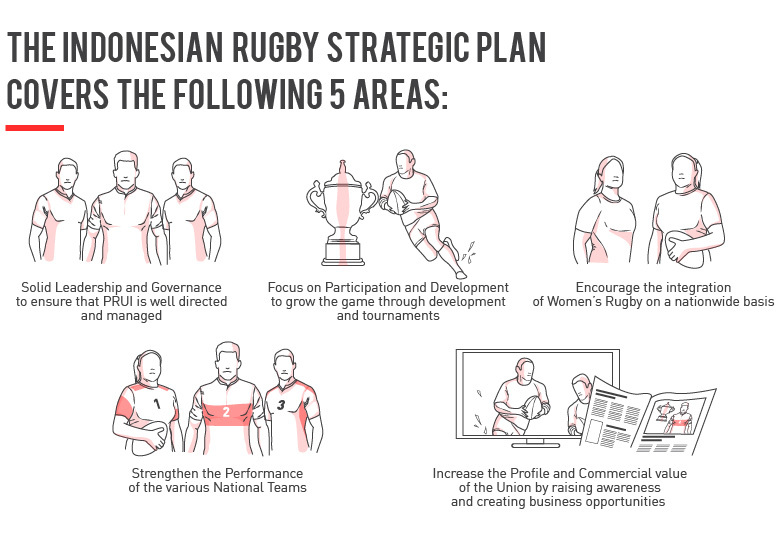 Previously PRUI was known as Indonesian Development Rugby (IDR) from 2004-2005, Indonesian Rugby Football Union (IRFU) 2005-2010, before it became PRUI until now. Prior to the formation of PRUI, Rugby had been played in Indonesia as a social sport for more than 40 years (mainly by expatriates) and historic records show that Dutch and British nationals also played rugby during the early part of the 20th century. PRUI is known as an organisation that is responsible for the management and development of Rugby Union in Indonesia. PRUI is legally registered as a sporting association in accordance with the Law governing the Republic of Indonesia. PRUI was granted Associate Membership of the Asia Rugby in September 2004 and gained Full Membership in November 2005 following progress made by the Union to develop Rugby. PRUI gained Associate Membership of World Rugby in May 2008, and recognised as a Full Member of the IRB, now known as World Rugby in November 2013. On a local scene PRUI was recognised by Komite Olahraga Nasional Indonesia (KONI) as being the national sporting organisation responsible for the development and management of Rugby in Indonesia in August 2013, under the Presidency of Air Marshall (ret.) Pieter Wattimena. PRUI become a member of Komite Olympiade Indonesia (KOI) in February 2015. With the number of new clubs and provincial unions tripling over the past year along with the exponential number of players, PRUI participated for the first time in the National Games (PON) exhibition in 2016. As a result of it, Rugby 7s will be officially played at PON 2020. Under new PRUI President Didik Mukrianto SH, MH, PRUI also participated in SEA Games Kuala Lumpur in 2017 & successfully hosted Rugby 7s as an official sport at the 2018 Asian Games in Jakarta & Palembang. With regular coaching clinics for coaches, MOs and other supporting resources, PRUI looks forward to a continued increase in players, games and tournaments in the future. Marsda TNI (Purn) Pietter Wattimena S.Ip, MM.,MH. Mayjen TNI (Purn) Amiruddin Usman S.Ip. Chairman: Didik Mukrianto, SH., MH. Vice Chairman I: Yudha Ramon. Vice Chairman II: Agus Djamhoer. Vice Chairman III: Atlantica Ruyu Vau. Vice Chairman IV: Fikri Al-Azhar. Secretary General: HRG Radityo Gambiro. Deputy Treasurer II: Daniel Rahadian Nugroho.